My father was the son of Italian immigrants who moved to the Bronx and then to Yonkers, where my father was born. These circumstances made it inevitable that my father’s baseball hero would be the great Joe DiMaggio, center fielder for the New York Yankees. I inherited this allegiance through a combination of genetics and socialization. DiMaggio retired and was replaced by the great Mickey Mantle. I have very vague memories of Mantle in his prime and mostly remember the prematurely aging and nearly crippled slugger toward the end of his career, which coincided with the beginning of an era in which the once invincible Yankees collapsed — to put it as politely as possible, they sucked, really sucked, when I was in my late preteens and early teens and used to journey from Yonkers to the Bronx to sit in the upper deck of the Stadium and cheer on an awful team that featured the likes of Horace Clarke and Mike Kekich and Rich McKinney and…. 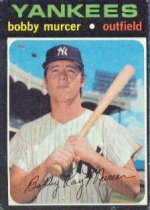 who was Oklahoma-born and bred just like the Mick — Bobby Murcer, my favorite Yankee from that era, who died July 12 from a malignant brain tumor. Murcer, 62 when he died Saturday, was among the best ballplayers of his era –a Gold Glove winner and a five-time All Star. He went on to a stellar career as one of the best TV announcers the Yanks ever had. When I was about 12 my father took me to a preseason open house at the Stadium — I got Bobby Murcer’s autograph on a poster, and I still have that autograph. Funny thing, though: I have absolutely no memory of actually meeting Murcer, although I’m sure I must have, however briefly. What I do remember is Murcer’s dignity and Hollywood-like heroics in the game the Yankees played after the funeral of his best friend Munson, killed in a plane crash in 1979. And I was actually sitting in the upper deck for a doubleheader against the Cleveland Indians in which Murcer hit four consecutive home runs over the course of the two games — and, as I recall, nearly hit a fifth-straight homer, sending the Cleveland Indians’ outfielder back to the wall of the short porch in right. The night before Bobby Murcer died, I went to a minor-league baseball game, which might start some people spewing some of that feel-good Americana pseudo-poetic nonsense spread by the likes of Bart Giamatti and in movies like “Field of Dreams” and “The Natural”and the PBS TV series by Ken Burns…the notion that baseball is a comforting game because the goal of the game is to make it home safely. Well, OK, it’s harmless, but that pop psychology interpretation of baseball is not the baseball I know. Nevertheless…I do hope and pray that the Yankee hero of my childhood, a good ballplayer and a good man named Bobby Murcer, is now safe at home.